Four DTM Mercedes AMG C-Coupés in Top 5. 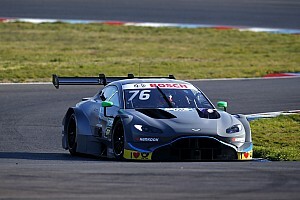 In tricky weather conditions, Mercedes junior Pascal Wehrlein (gooix Mercedes AMG C-Coupé) took his maiden victory in the DTM, making him the youngest winner ever in the series. 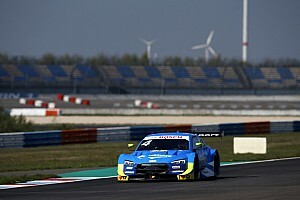 The 19-year-old already made DTM history on Saturday by becoming the youngest pole-setter in the DTM. Christian Vietoris (Original-Teile Mercedes AMG C-Coupé) in second place gave Mercedes-Benz their 101st one-two victory in the internationally popular touring car series. Vietoris improved his position on the first laps after the start to move up from P11 to P2. Vietoris on 59 points is placed second in the overall standings with two races to go until the end of the season. BMW driver Marco Wittmann clinched the championship title before season’s end at the Lausitzring. In all, four DTM Mercedes AMG C-Coupés finished in the top five. Daniel Juncadella (Petronas Mercedes AMG C-Coupé) in fourth place repeated his best result so far in the DTM. Robert Wickens (FREE MAN’S WORLD Mercedes AMG C-Coupé) finished fifth. Vitaly Petrov (DTM Mercedes AMG C-Coupé) booked P12 and Gary Paffett (EURONICS Mercedes AMG C-Coupé) took P13. Paul Di Resta (DTM Mercedes AMG C-Coupé) retired before the end of the race. 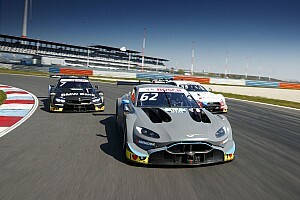 The next race: The ninth round of the DTM takes place on the weekend of September 27th-28th at the Circuit Park Zandvoort in the Netherlands. Wolfgang Schattling, Head of Motorsport Marketing & Communications: “Firstly, I would like to congratulate Marco Wittmann and BMW on winning the DTM title, but we also have all good reason to be pleased. We never expected before the race to get four cars in the top five. Pascal’s performance was extraordinary. He maintained his secure lead to the finish line, becoming the youngest winner in the annals of the DTM. We produced the previous youngest ever DTM winner 19 years ago in Dario Franchitti. Back then, Pascal was just being born.